Pam is becoming more angrier by the minute and day as she lashes out on the people and destroying property that once stood in her way. We send our heartfelt and compassion upon the people in the South Pacifc. You all are in our thoughts and prayers. #TCPam intensified late last night into a Category 4, still remains but is due to increase to a level 5. They say a picture can tell a thousand words, but this one is quite blunt and doesn’t really need words to explain what is happening. The people here are bracing for one of the most dangerous and damaging Tropical Storms of all-time. Animal Protection @MoveTheWorld has distributed “Animal Preparedness” messaging to all animal owners in affected Countries. The National Disaster Management Council meets at NDMO HQ. The National Disaster Emergency Operations Center in Fiji is activated and goes into 24-hour operational period. Humanity Road sends out updates on Fiji’s government. “Fiji’s military is deployed throughout the Country. Vanuatu activates emergency plans as Category 5 approaches. Al schools in Northern, Eastern and Western Divisions are shut down on March 12, 2015. When NASA’s Terra satellite passed over Pam on March 11 at 22:50 UTC (6:50 p.m. EDT), the MODIS instrument captured visible data on the storm. The data was made into an image at NASA’s Goddard Space Flight Center in Greenbelt, Maryland. The image showed a thick band of powerful thunderstorms wrapped around the eye of the storm. Banding of thunderstorms from the east and north wrapped into the center of circulation. 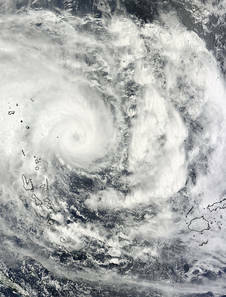 At the time of the image, Pam was moving through the Solomon Islands and Vanuatu was southwest of the storm. Sources: NASA, Humanity Road, Kiribati Abau Ni Koaua, Fiji Government.